This pattern is my tried and true hat design. 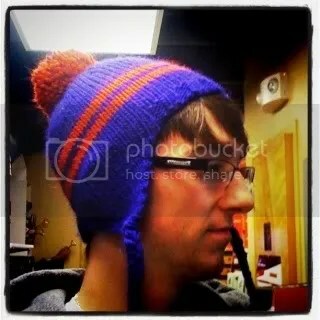 A spin-off of Far North Yarn Co.’s Alaska Ear Flap Hat, I have made probably about 50 hats over the past 7 years. 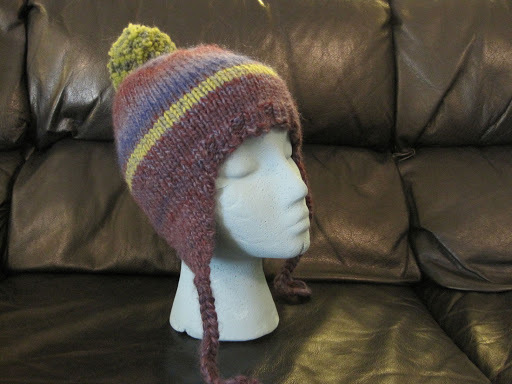 Here is my pattern along with several photos of different hats I’ve made. I make the size small for an average head. That’s 72 stitches total. 1 skein bulky yarn. I love Lamb’s Pride. With two double point needles cast on 2 stitches. Purl 1 row. Work back and forth in stockinette stitch. Every time you do the knit side (right side), increase in the front and back of the first and last stitch. This will create the triangle shape. Keep going until there are 16 stitches for the XS, 18-S, 20-M, or 22-L. Place these stitches on a holder. 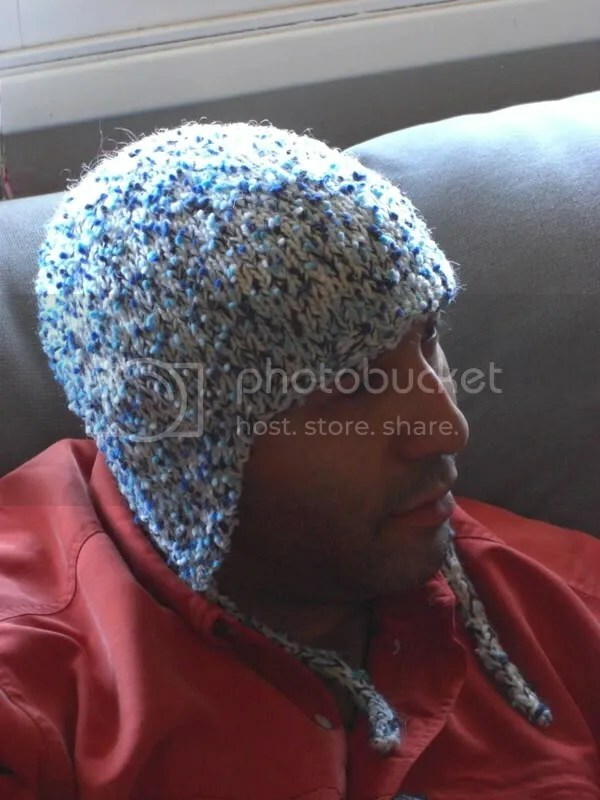 Hat: With the circular needle, cast on 12-XS, 14-S, 16-M, or 18-L stitches for the back of hat; knit across stitches of the first ear flap making sure the right side is facing you. Cast on 20-22-24-or 26 stitches for the front; knit across second ear flap. There will be 64-72-80-or 88 stitches in all. Join stitches carefully without twisting. 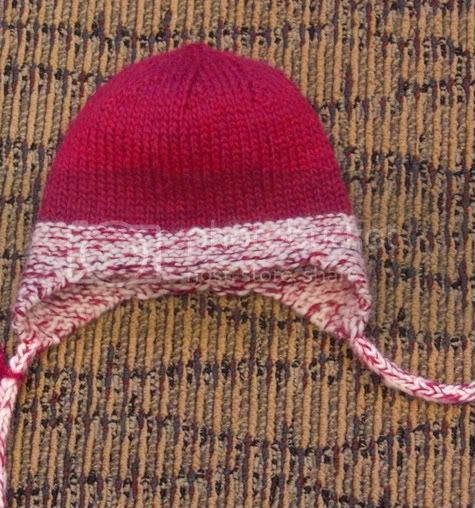 Knit 2 purl 2 on the front and back part of the hat (regular knit the ear flaps) for four to six rounds. This will make the nice ribbing and will prevent the hat from curling up. 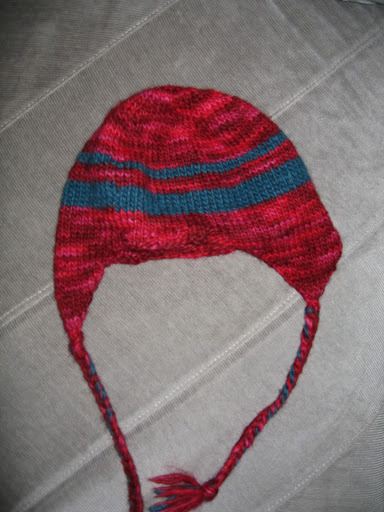 Continue knitting until the hat is about 5.5 inches tall. I usually go with 32 rows from the edge of the hat. Round 1: Knit two together, knit 6. Repeat for one round. Round 5: K 2 together, K 4 for one round (this is where you should probably switch to the double points). Gather remaining stitches with a darning needle and fasten off. Weave in all tails. I just braided yarn together to make the ties for the flaps. You could also do a cord stitch where you have three stitches on a doublepoint. Knit to end of row and instead of turning the work, just push them back up to the end so the yarn wraps around the back. Knit in this way till it’s long enough. Braiding is faster and pretty. Sometimes I add a pom pom. 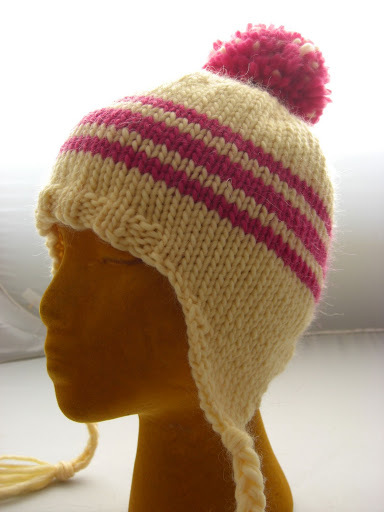 This is especially nice when making a stripey hat because you can include all the colors in the pom pom and it’s faster to make than one color. 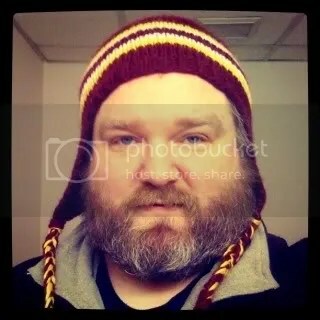 Here’s a montage of some of the hats I managed to take photos of before giving them away. 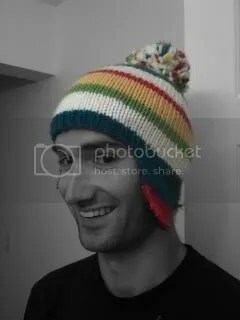 do you have an idea of the gauge for that hat? 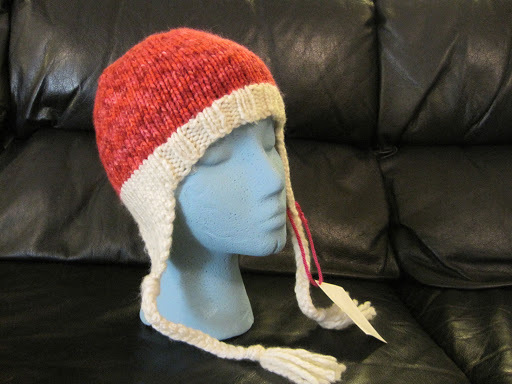 I've never gauged any of my projects, but when I went back and measured two of my hats, one had 3.5 stitches to the inch and the other had 4 stitches to the inch. i was wondering what mesurments the medium and large hats end up being. This is hard to say since everyone knits with different tension. For myself, I knit the size small and my head is about 21 inches in circumference. I tend to make the size medium or large for my husband and his head is 24 inches in circumference. If I’m knitting with really bulky yarn, I’ll make him the size medium and if I’m knitting with a lighter weight yarn I’ll make the large size. I hope this helps. 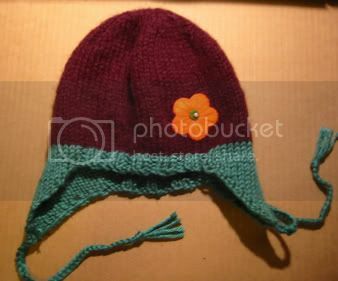 Luckily hats don’t take too much time and yarn so if it isn’t the right size you can donate it to charity and try again. 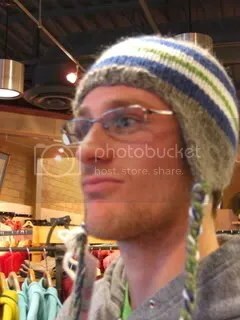 Hey, I’m confused about when you say knit on the ear flaps. Do you use both sides of your yarn (the tail and the one going back to the ball)? Hi Ang, the ear flap should be on a separate piece from the work you are starting to cast on. After you cast on the initial stitches, using the yarn that’s attached to the ball you will start picking up stitches on the ear flap and knit along the whole flap. The first stitch you knit into on the flap may be loose because it has the tail you just cut, but keep knitting through and you can tug on the tail later to tighten up the stitch. 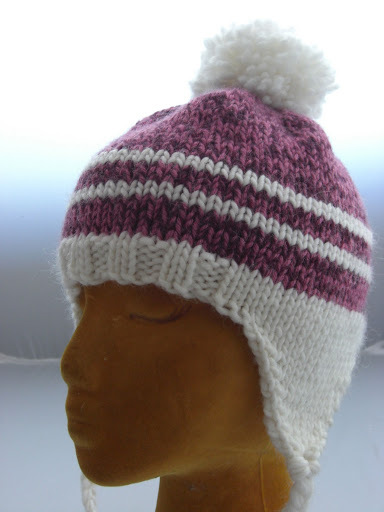 Once you knit across the first ear flap, you’ll cast on the front stitches of the hat. Then repeat with with second ear flap. I do hope I was able to help you. If only I could show you, then you’d understand it’s much simpler than describing with words. If you still don’t quite get it, I recommend stopping by a local yarn shop (not a big box craft store) or even a senior center and asking a seasoned knitter. Hi Hannah, I think the xs size would work just fine, but I would use size 10 needles. 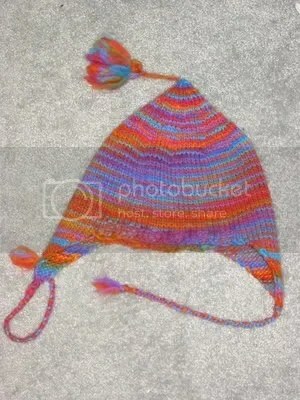 It’s my first time knitting a hat with flaps, so I was curious when I make the flaps on the double pointed needles, do I cut the end yarn and hide it in the hat after it’s finished? or is there a special way to tie the last stitch!? I can’t find any pictures of that step where the flaps are being added the to the casting on. I’m such a visual learner, and all, if not most knitting instructions assume readers just magically know these things! That’s a great question and I’m sorry I don’t have a photo of this step. When you finish making each earflap you need to cut the yarn and later you should weave in the ends of the yarn into the inside of the hat using a darning needle. Here’s a great tutorial on how to properly weave in ends: https://www.youtube.com/watch?v=v-p4qsiyuI8. 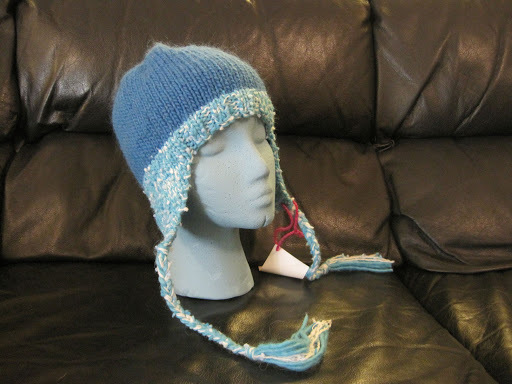 Here is a video that shows how to knit the ear flap onto a hat: https://www.youtube.com/watch?v=mS0yh3LU_d4. Keep in mind the video has a different number of stitches for her hat pattern, but the technique is the same. Thanks so much! This is soooo helpful! You’re most welcome! Please let me know if you get held up in the process! It sounds like you need to use more yarn for your pompom. I use a borderline ridiculous amount of yarn. I also end up trimming quite a bit of it away in order to shape it. I love this pattern but went to the wool shop without it so got home to realise that my no3 son has chosen a beautiful bright orange yarn (his fav colour) with a woven in reflective streak (he’s just been doing keeping safe in the dark at Beaver scouts!) that is actually super bulky rather than bulky! 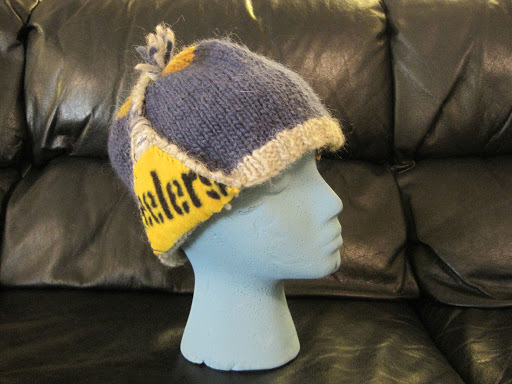 He is so looking forward to his hat and I don’t want to dissapoint him but my lack of experience means I don’t know how the difference in the bulky-ness of the wool will affect the size….can you help with a bit of advice? if it helps the guage given on the yarn says 10x10cm is 8stitches and 12rows (it’s in german so I think I’ve got that right!) and recommends 10mm needles. 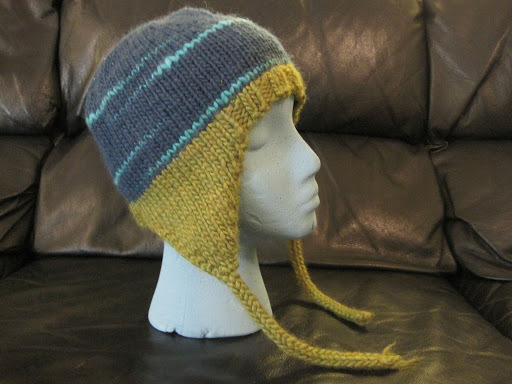 I’m making the darling earflap hat and trying to find the pattern for the cute hat pictured on this pattern on the last page (small picture) with a cable on the side. 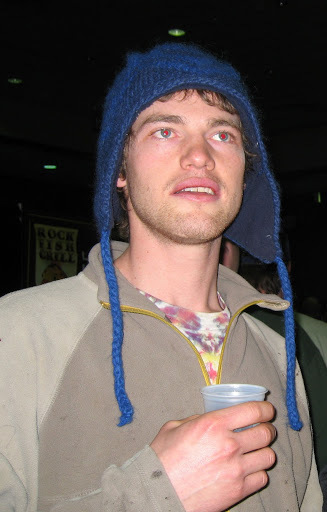 You are the first person to ever point out that particular hat to me. I don’t have a pattern written up for it! All I did was follow my basic ear flap pattern, but on one side I p2, Cf4, p2 every four rows (just knit 4 for the other three rows). Then when I started decreasing I just winged it! I’m currently working on a similar pattern for much smaller needles, but it will be an exclusive pattern for allfreeknitting.com. I will try and let you know when it is published. Made this for my 5 month old grandson and it’s a little big, but adorable! Thanks! You’re welcome Marian. Thankfully babies grow fast! 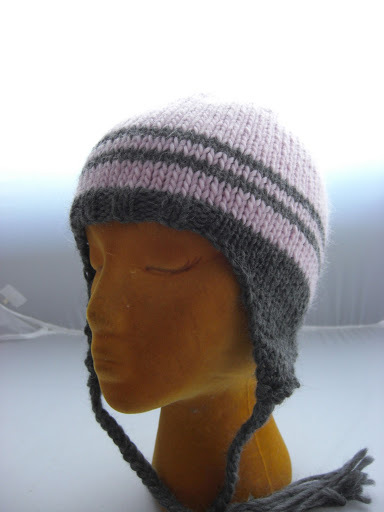 Your hats are lovely and this is by far the simplest pattern I’ve found for an ear-flap hat. I have a question though… My best needles for magic loop are only size 4. So if I use those and worsted-weight yard, by how much would to recommend increasing the stitch count to obtain roughly the right size (for the large)? I realize I’m going to be making a lot more work for myself by being stubborn and using my small needles, but I like the magic loop method for hats so much, and I don’t want to buy more needles if I don’t have to. Size US 4 needles are significantly smaller; I’ve never knit a hat with that size of needle. I can’t really give you a good recommendation as that would require completely rewriting the pattern. Ravelry has lots of great free patterns that use that needle size. I would take a look on there and see if you can merge one of their patterns with mine. I found one hat that called for 152 stitches. That would mathematically work with this pattern since it’s divisible by 8, but as for the size of the earflaps and ribbing, you’d need to count up from my pattern to get the proportions right. Help – I sent my daughter to buy the yarn and she purchased worsted weight (4) as she was more interested in the color. Can I do anything to adjust the pattern. I would wither double up the worsted yarn and knit the regular pattern with 72 stitches on size US 10 needles or I would knit with one strand of worsted on size US 9 but follow the pattern using 80 stitches. You’re welcome, Anna! It’s one of my favorite patterns to knit for the same reasons you mentioned. Absolutely love this pattern. I made it with Loops and Threads Chrisma variegated and it came out self striping. Very attractive. I decided on the braids for ties which looks better than I cord. The placement of the ear flaps is perfect with just enough difference between front and back to for well. Made a couple for Christmas presents. Thanks for sharing such a wonderful pattern. Love it!!! Thank you for your kind words. This is one of my favorite patterns. I’m so happy you found it helpful. I have never tried it with variegated yarn before. What a good idea! Thanks for sharing your post with me and for trying my pattern. I love the colors you chose! Hiya! Thank you for sharing this pattern! I’m just wondering if the XS would be suitable for a 3-4 year old? It really depends what size yarn you use. I’ve made both xs and S for a 3-4 year old. If you’re using thicker yarn, I would try size s.
Thank you for responding! I’m using the Stylecraft Special Chunky yarn, would you recommend xs or s with that? I am not familiar with that brand but if it’s chunky I would try knitting the xs on size 10 US needles. Thank you for the pattern Natasha. 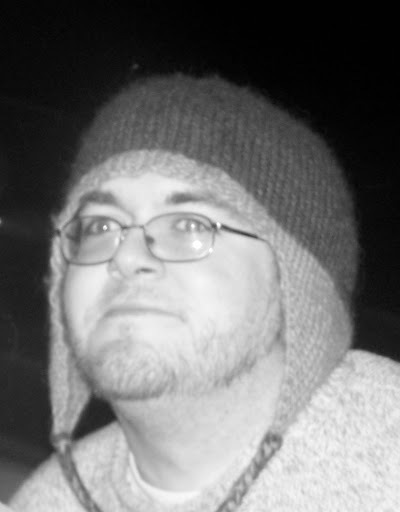 This is my second time making this beanie, but it’s been at least a year and I can’t recall how I began the earflaps. These days when I make this pattern I’ve started with casting on four stitches. This makes it a little easier to work with. Then when it comes to the first increase row I knit in the front and back of the first stitch, knot two and knit in the front and back of the last stitch. I recommend trying it this way and seeing if it makes more sense. I have a few questions about your pattern. – an average size head . . . is that an adult or a child’s? – how many grams in your skein . . . 50, 100, 170? – how long to make the braids or I Cord? Thank you for your time and attention in regards to this matter. Yes the info you shared is a big help. 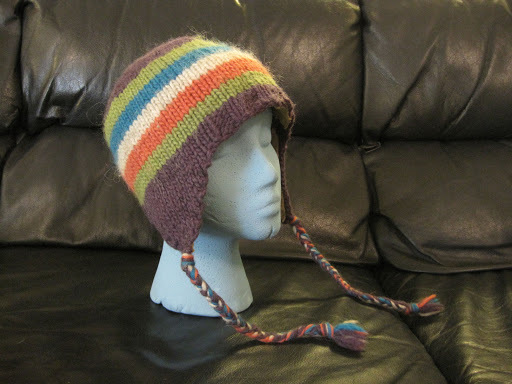 This is probably a dumb question, but should I still be knitting one row purling one row for the main body of the hat, or should it be all knit stitch after joining the earflaps and casting onto the circular needles? Not a dumb question if you’re not familiar with knitting in the round. When you knit in the round, since you never actually reach the end of a row, you’re actually knitting into the back of each round, thus creating a stockinette stitch without the need to purl. It’s like magic! Once you knit in the round, you just keep knitting around and around and it looks just like when you knit one row, purl one row when on straight needles. I made the hat and it looks great, but how do you attach the braids so they don’t show or look bulky? One more question. How many strands do you use? I used one of each color, so my braid was kind of thick. I used the tail of yarn on the ear flap and sewed the braid on with that. 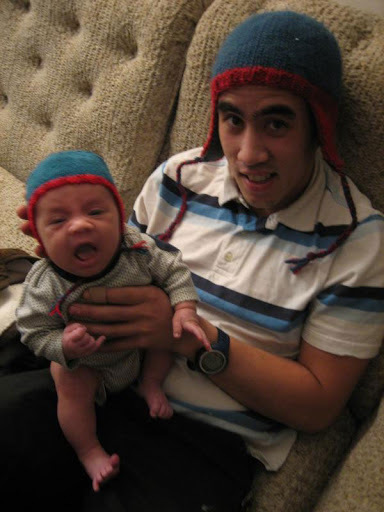 It looks ok, but I do it your way with the next hat. Thank you for your prompt answer! I’m going to try your bagel recipe next! Love the pattern and knitting in the round, especially with my 9 and 12 in. needles. I need some help with attaching the flaps and the added on stitches for the front and back. I have enough yarn ends to tie up a dog! May this hat be knit for sale if you are listed as the pattern author? Oh thank you!! That is very kind!! Thank you for your easy to work pattern! I found one years ago but seem to have misplaced it. LOL. Having many grandchildren that seem to always to come visit with NO hat, I can’t wait to get started!!! Thanks again and have a great day!!! !